This handguard was engineered for easy installation and to provide a durable, secure and modular mounting platform for a variety of accessories and components. 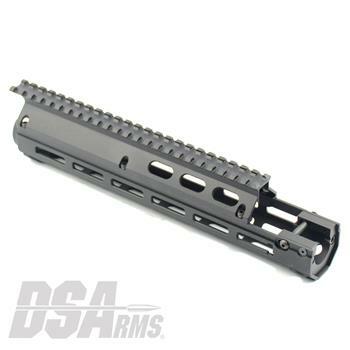 This handguard utilizes a cross bolt system and 2 heat-treated steel retaining blocks (supplied) and your existing handguard cap for attachment. Featuring a 1913 Spec. Picatinny Rail at the 12 O'clock position, this handguard will line up perfectly with the DS Arms Extreme Duty Extended Scope Mount for a continuous Picatinny top rail on your rifle. Paying homage to the traditional FAL handguards, our M-LOK handguard features 3 oval vent holes on either side of the handguard. These vent holes along with the slim clean profile of the handguards allows you to have a modern attachment system without sacrificing the iconic look of the FAL rifle. The lower section of the handguard is designed to vent the heat of the barrel thru the uncovered machined slots. It is also designed to be further away from the barrel in order to reduce the felt effects of heat for a greater amount of time, unlike other models currently on the market. This product is proudly engineered and manufactured in the USA.